Without the forest, our entire culture would disappear. And without our culture, the forest would have disappeared a long time ago. Grootschalige ontbossing in de regio (de Surui zelf wonen in een reservaat) is dan ook de grootste vijand van hun cultuur. In Google Maps zie je duidelijk het verwoestende resultaat daarvan. Na de eerste contacten met "white men" in de jaren '60, en na de eerste kennismaking met internet, besefte stamhoofd Almir al snel dat pijl en boog in deze oorlog niets uithalen. Laptops en smartphones zijn de wapens van nu. Hij zocht contact met Google. The Surui mapmakers created POIs [points of interest] that reflect their traditional culture's close interdependency with their forest home. So instead of hotels and gas stations, on the Surui map you'll find the locations of parrots and toucans, or the three kinds of trees necessary to make their bows and arrows. You'll learn where to find the Acai trees (which provide delicious fruit as well as the thatch for their maloca longhouses), the locations of good hunting grounds for the porcao (wild pig), and where the jaguar roam (jaguars have particular spiritual significance to the Surui people and figure in their creation myth). There are also sites and stories of historical battles with other tribes and with the white settlers who started arriving after "first contact" in 1969. En bovendien namen ze met het Surui Forest Carbon Project hun toekomst in eigen hand. Our people is more known under the name of "Surui". This name was given to us by the anthropologists at the time of our first contact ("Hurui" means enemy in the native language spoken by the persons who guided them); while our true name is "Paiter" which means in our language: "we, the true people." Enorm respect voor het leiderschap van stamhoofd Almir. En zijn visie. 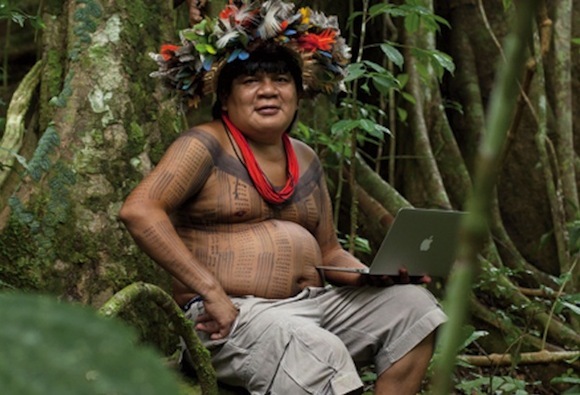 Foto: stamhoofd Almir van de Surui, met laptop in het regenwoud.